Algebraic identities play an important role in the world of Algebra. Strengthen your algebraic skills by downloading these algebraic identities or algebraic formula worksheets on various topics like simplifying and evaluating algebraic expressions, expanding the expressions, factoring and a lot more. All worksheets are synchronized with common core curriculum and are highly recommended for middle school students. 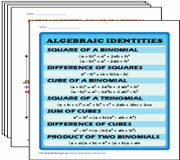 Algebraic identities charts are also included. 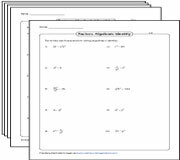 Download and print these eye-catching charts, available in color and black-and-white format, to learn and memorize algebraic identities. Charts representing the geometrical interpretation act as visual tools for students in learning algebraic identities. 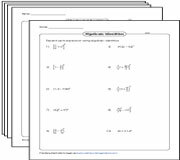 This section is packed with worksheets that involve the use of algebraic formulas to expand each algebraic expression. Access this range of worksheets to learn how to factorize polynomial expressions by applying the correct algebraic identities. 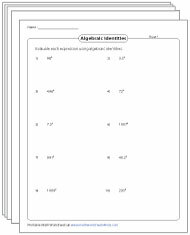 Put your algebraic identity skills on test with these evaluating expressions worksheets. 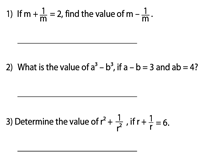 Use appropriate identities or formulas and find the value of each expression. 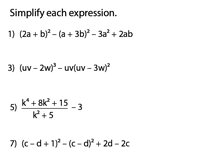 In this set of PDFs, expand the expressions by applying appropriate algebraic identities and then simplify the expressions. Validate your response using the answer keys provided. A set of five problems are enclosed in each worksheet. Read each problem and select the suitable algebraic identity. Plug in the given value to find the value of the given expression.